Donald Macleod explores the life and music of bandoneon virtuoso and composer Astor Piazzolla, through five locations, beginning in New York, the city in which he grew up. Donald Macleod explores the life and music of bandoneon virtuoso and composer Astor Piazzolla, through five key locations, beginning in New York, the city in which he grew up. Piazzolla’s links with tango begin in New York. Living there as a child, it’s where he encountered one of tangos greats, the singer Carlos Gardel and it’s where he was introduced to the instrument with which he conquered the world, the bandoneon. Performer: Astor Piazzolla. Performer: Pablo Ziegler. Performer: Fernando Suárez Paz. Performer: Horacio Malvicino. Performer: Héctor Console. Performer: Astor Piazzolla. Performer: Gerardo Gandini. Performer: Horacio Malvicino. Performer: Daniel Binelli. Performer: José Bragato. Singer: Héctor Console. Performer: Antonio Agri. Performer: Jaime Gosis. Performer: José Bragato. Performer: Leo Jacobson. Performer: Jorge Barone. Performer: Oscar López Ruiz. Singer: Kicho Díaz. 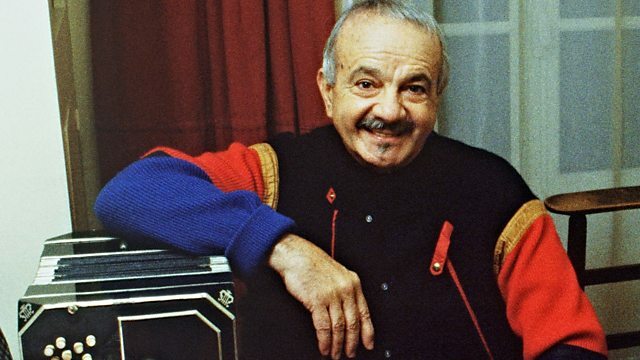 Performer: Astor Piazzolla. Performer: Dante Amicarelli. Performer: Antonio Agri. Performer: Oscar López Ruiz. Performer: Kicho Diaz. Ensemble: Astor Piazzolla Quintet.